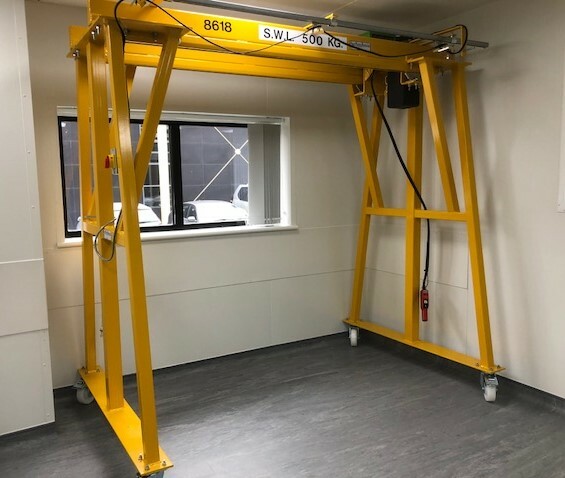 A special mobile gantry designed to maximise the raised hoist hook height by fitting the Stahl electric chain hoist at the very top! This is achieved by mounting the hoist on top of the trolley (Foot Mounting) travelling between a pair of tracks. We had to make the gantry 'A' frames wider to accomodate the twin tracks and also internal bracing. 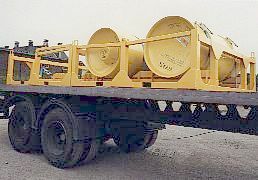 A lifting system used to lift Chlorine drums from a delivery lorry into a Chlorine store. Due to planning regulation restricting the size of the Chlorine room two cranes were required. 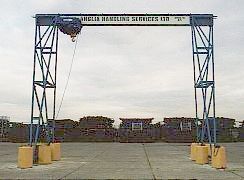 A overhead crane on a freestanding structure is used to unload Chlorine drums from a lorry and lower them to the ground. A goliath gantry crane travelling on rails cast into the floor is used to lift the drums from the ground outside and travel into the Chlorine store. Here they are lowered onto a concrete plinth, secured and connected to the water intake system. 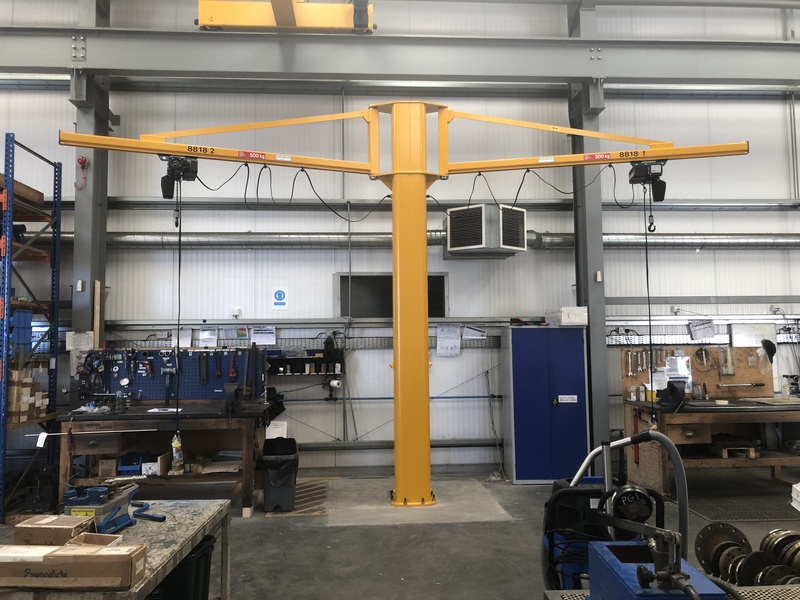 A 1000 kg post mounted over braced jib crane fitted with a Stahl electric chain hoist and a self-suction vacuum lifting beam to load a new cutting machine. The vacuum lifting beam requires no external power and creates its own each time it lifts. It has 6 x adjustable and lockable suction pads to suit a variety of load sizes. A purpose made pallet fork with automatic balance designed to pick up pallets of large steel plate using an overhead crane. The fork has a fixed height with adjstable width forks. A post mounted jib crane with an under braced arm complete with a Demag electric chain hoist built into a hand pushed trolley. 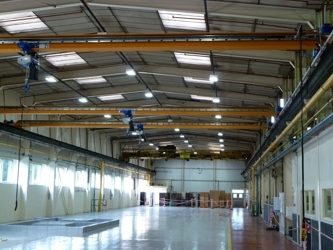 The hoist is supplied with dual speed lifting and a pendant control. This crane is used for loading coils of steel from a pallet onto a machine unwind shaft. An under braced design is used due to limited headroom. 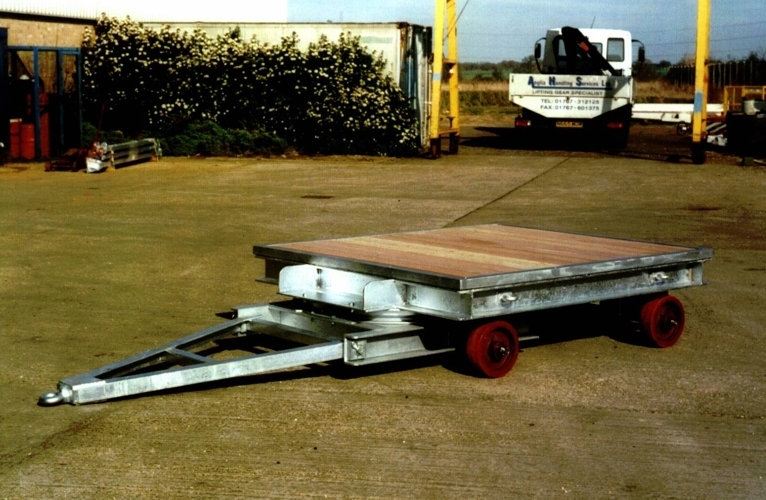 A heavy duty industrial trailer with a ball bearing turntable and a draw bar designed to be towed behind a forklift truck. The trailer platform is constructed from steel plate with angle welded around the perimeter and a hard wood top. Features include a galvanised finish, cast iron polyurethane tyred wheels and ratchet straps to secure the load. A lifting frame suspended by a 4-leg chain sling and fitted with a hand chain block on each corner. 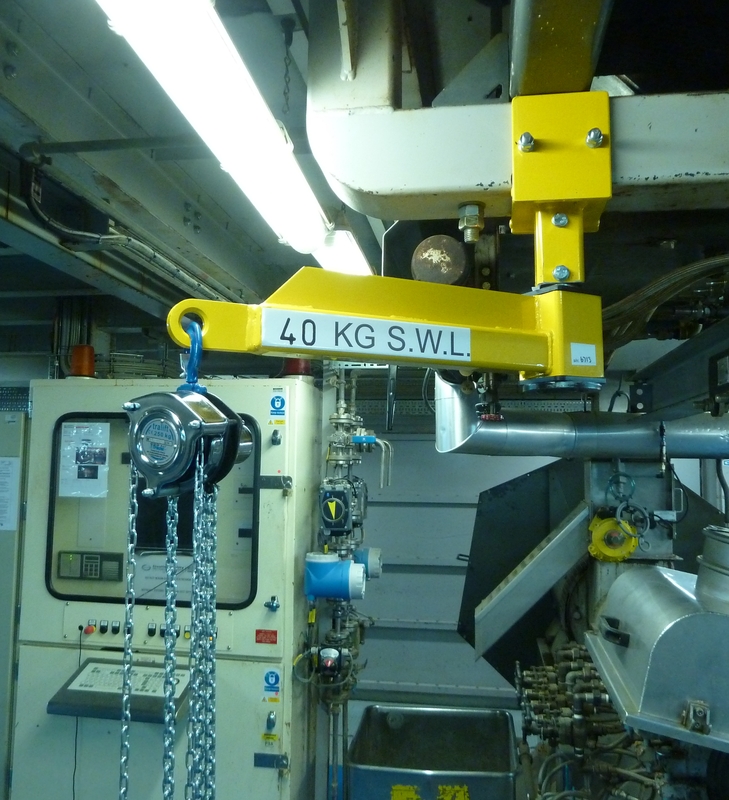 Each hand chain block is fitted with an auxiliary 8 tonne lifting beam. 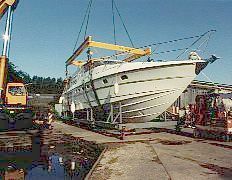 We also supplied 4 x 12" wide webbing slings designed for lifting a luxury cruiser into and out of a test lagoon. 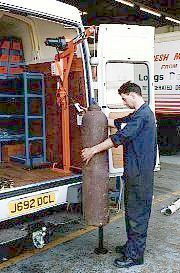 A set of stillages bolted to the floor of a flat bed lorry designed to safely transport hazardous chemicals, in this case liquid Chlorine. The Chlorine drums are strapped securely to the stillages using webbing ratchet straps. 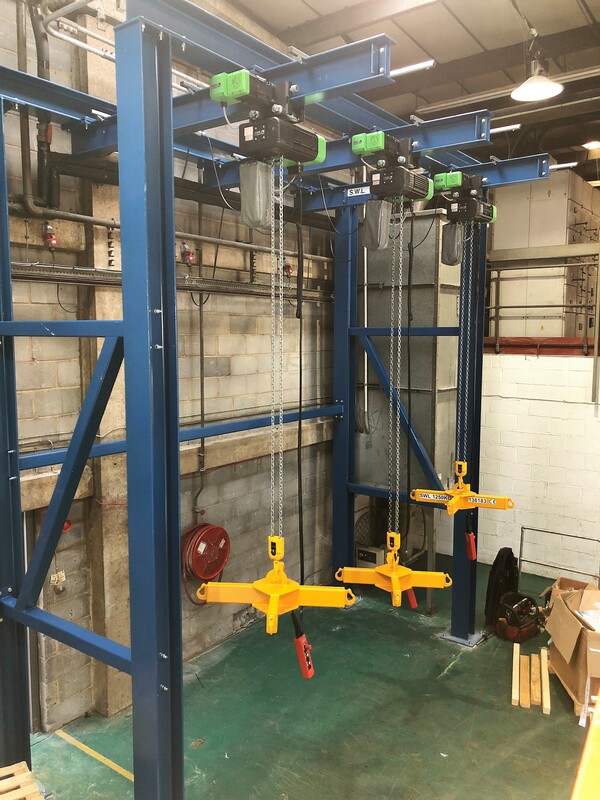 Three Demag overhead travelling cranes, each fitted with an electric wire rope hoist with dual speeds in all motions and controlled by a mobile pendant. Each crane is fitted with an infra-red anti-collision device to prevent them working too close together. 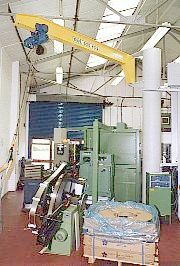 The cranes are used in a toolroom for refurbishing injection moulding tools. 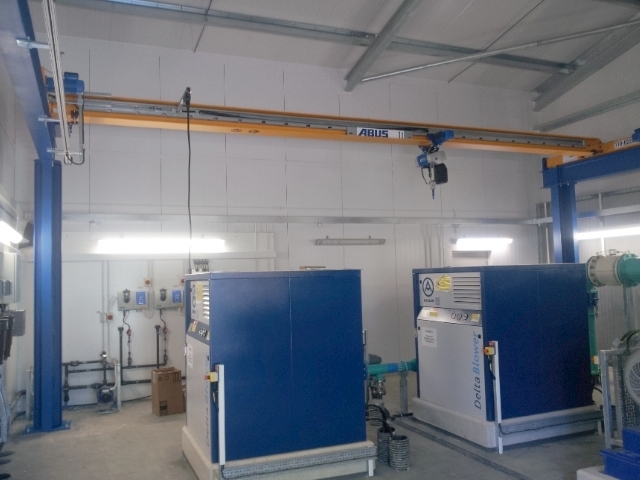 A freestanding fixed 'A' frame gantry complete with an Abus electric wire rope hoist with dual speed lifting and cross travel. 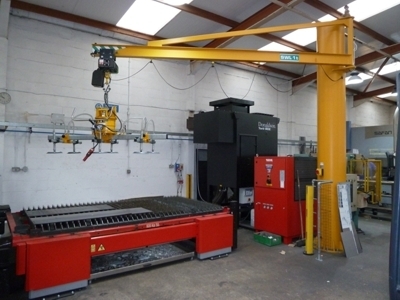 The electric wire rope hoist is controlled by a pendant control fitted directly to the hoist. 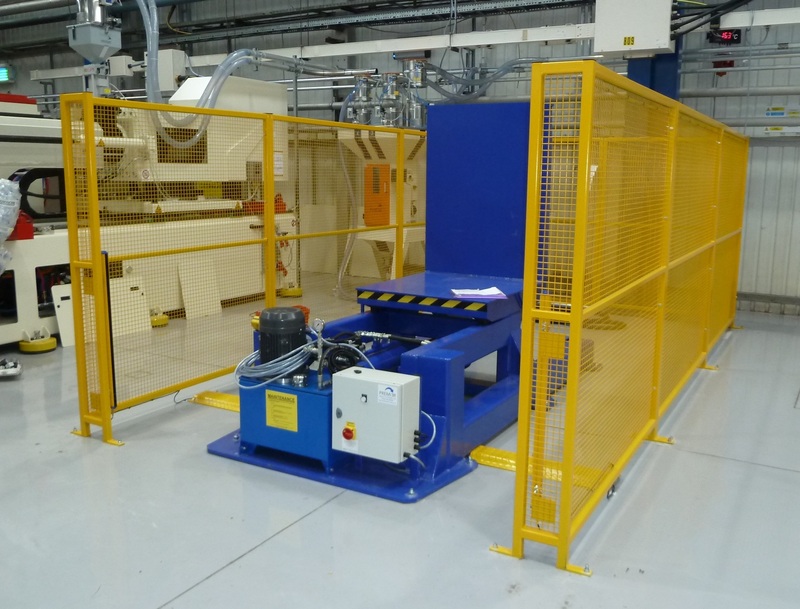 A hydraulic 90 degree inverter used, in this case, to turn injection moulding tools onto their side so they can easily be split in two for refurbishment. 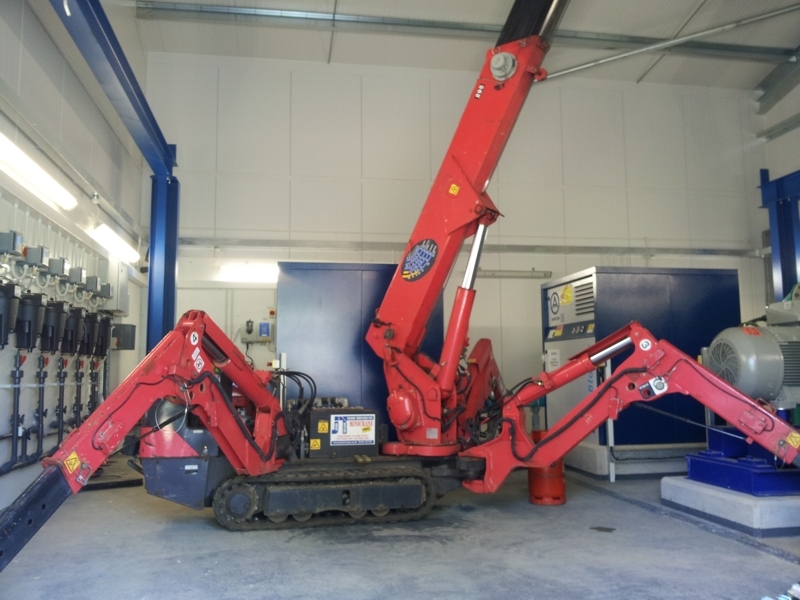 Features include guarding to the sides and rear and a sensor across the front to prevent operator access when the machine is operating. A gantry consisting of a runway beam supported by a goal post at each end leaving a cantilever at one end. The runway beam is fitted with a Demag electric chain hoist with two speed lifting and travel and is controlled by a mobile pendant. Features include a galvanised finish and a canopy at one end to protect the hoist when not in use. The system is used for removing pumps from below ground level. 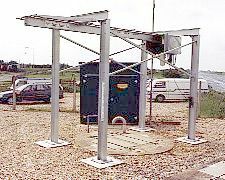 A four post structure fitted with 3 x parallel runway beams, each fitted with a Stahl electric chain hoist and a bulk bag spreader beam. Each hoist is fitted with a power travel trolley on a beam that cantilevers out in front of the structure. The hoist is used for lifting bulk bags whilst their contents are discharged into a hopper. 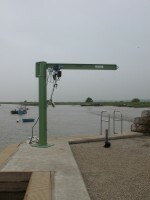 A four post structure fitted with a King electric chain hoist, an 'H' spreader beam and a fixed pendant control. The hoist can have a fixed suspension (as shown) or travel on a beam that cantilevers out in front of the structure. A Swinglift crane with a built-in wire rope winch powered off the vehicle battery (12 or 24 volt). 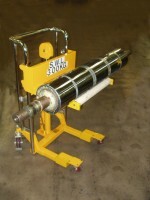 The Swinglift can be fixed in place (as shown) or mounted in a socket so it can easily be removed. 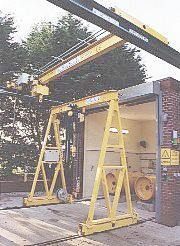 The Swinglift is normally fitted to a vehicle but we have also fitted them to trailers, a train carriage and inside a building. A VM180 VacuEasylift vacuum hoist complete with a 4 pad spreader beam, extended handle and bottom swivel to pick up stainless steel sheet. 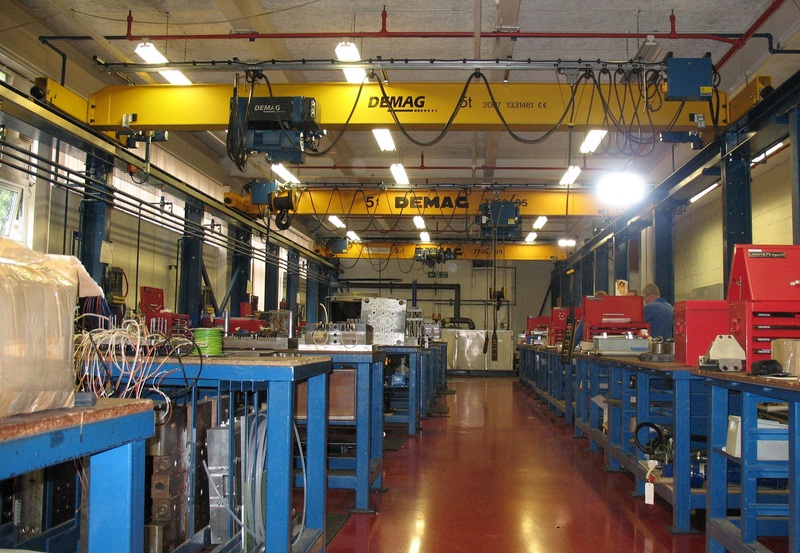 The VacuEasylift is suspended from a Demag KBK push/pull overhead crane system. Also shown is a manually operated sheet turnover device designed and built in-house. 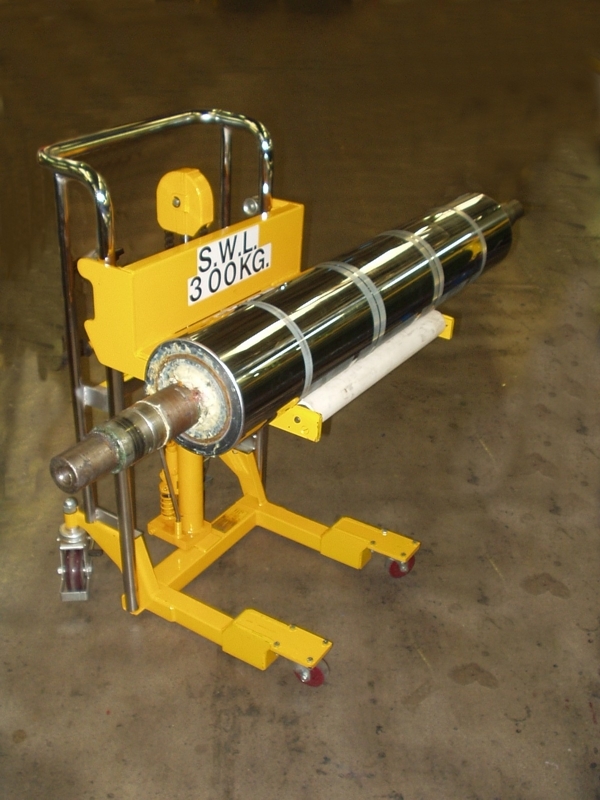 A special hand pushed hydraulic truck designed to lift machine rollers. 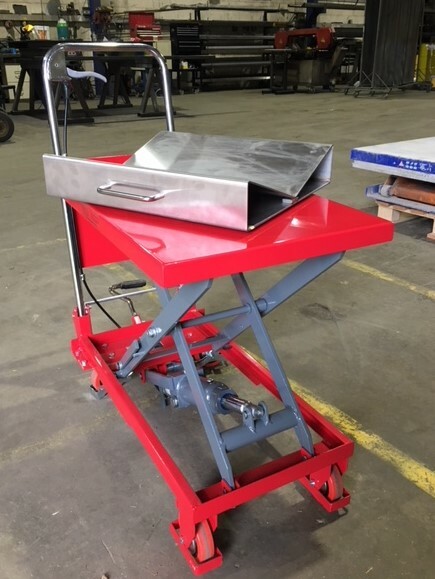 We have taken a standard truck, shortened the legs and added swivel castors, modified the platform and fitted a pair of gravity rollers with a non-marking rubber coating. 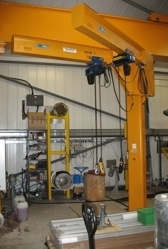 A post mounted under braced jib crane fitted with a Donati hand geared trolley and a single phase electric chain hoist. The hoist has a PVC jacket for additional weather protection. 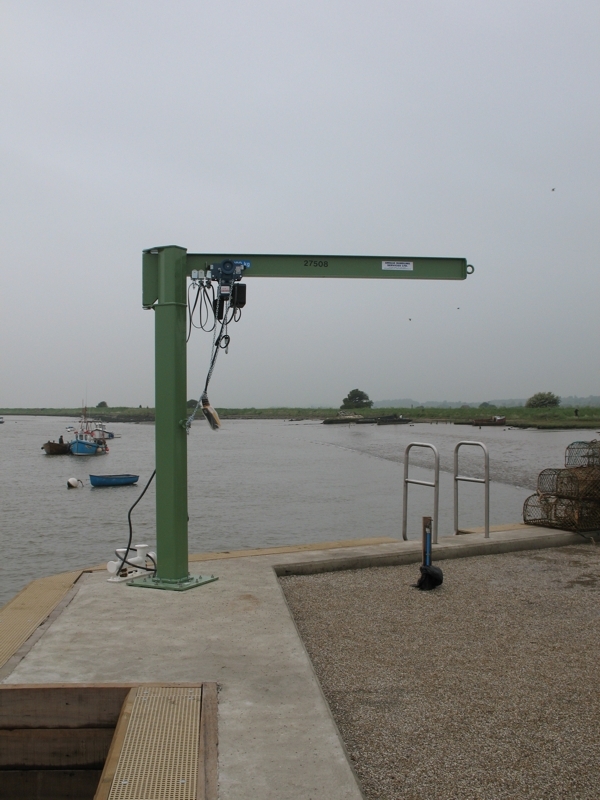 The jib is fitted to the refurbished quay at Orford in Suffolk and has been finished in a high quality green marine paint. It is secured to the concrete via a 600 mm square counter plate using stainless steel resin anchors. A jib crane fitted with TWO over braced track arms, each fitted with an integral push trolley and an electric chain hoist. The arms have the same safe working load. Each arm is fitted with a Donati electric chain hoist fitted to a hand pushed trolley. Care must be taken to ensure the arms do not clash. 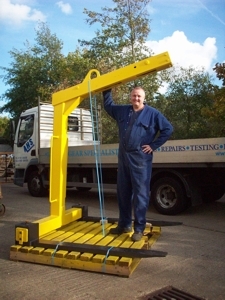 A jib crane fitted with TWO under braced arms, each fitted with an electric chain hoist. In this case the arms have different safe working loads. Each arm is fitted with a Donati electric chain hoist built-in to a hand pushed trolley. A special jib arm fitted to the underneath of existing steelwork. Fitted with a small hand chain hoist with hook suspension. 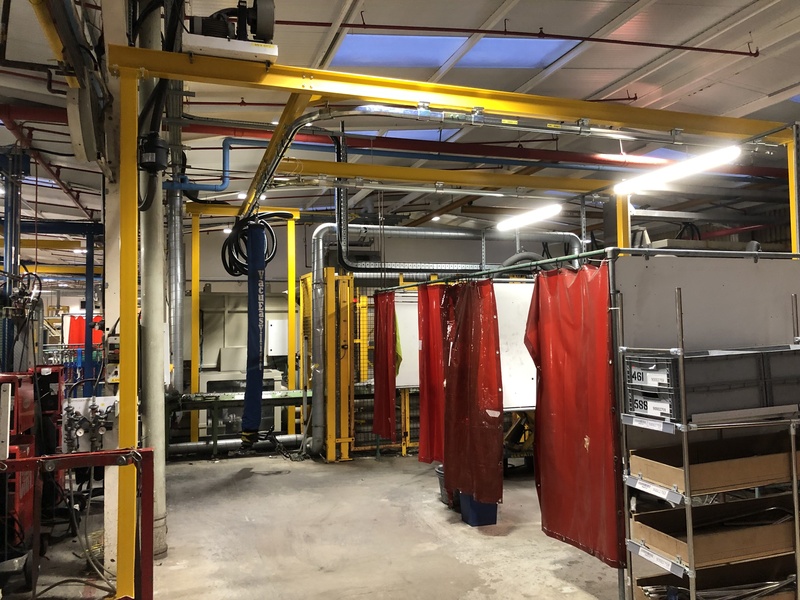 A single girder overhead crane installed with a freestanding support structure in a water treatment works. Access was very difficult and the solution was to use a crawler crane to install the supporting steelwork and the crane itself. 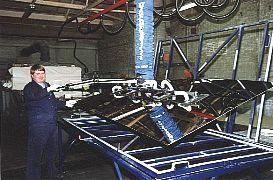 A mobile scissor lift with a manually operated hydraulic lift, fitted with a stainless steel Vee Block and turntable, designed to lift and rotate reels. 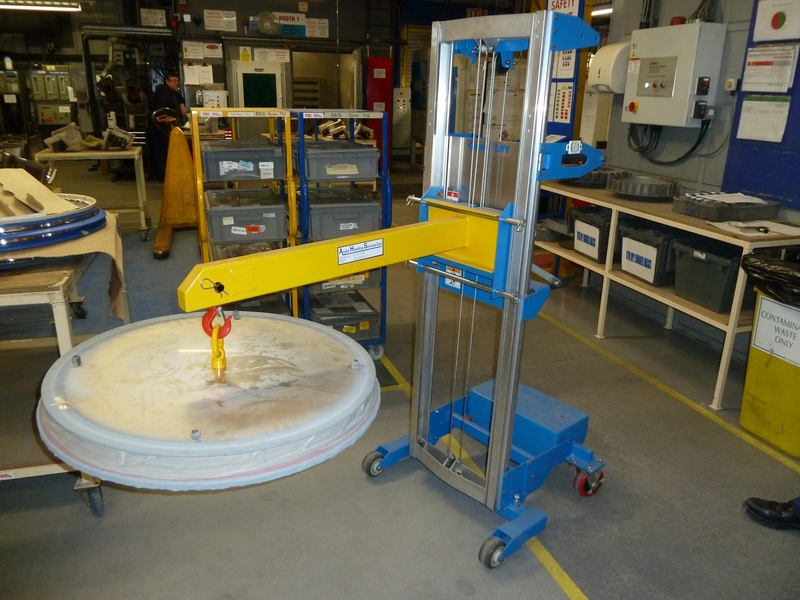 A VM160 VacuEasylift vacuum hoist complete with a single suction foot to pick up stainless steel cylinders. 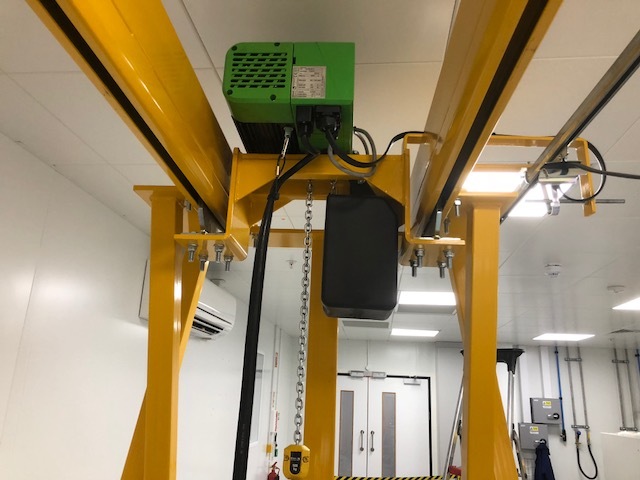 The VacuEasylift vacuum hoist is suspended from a system incorporating a runway track over each welding bay that each connect, via a pneumatically operated points switch, to a single track. 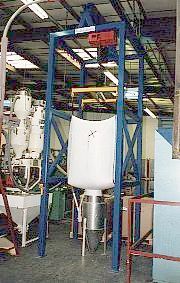 A special counterbalanced based on a Genie GL-8 but with the forks removed and a special jib arm added.